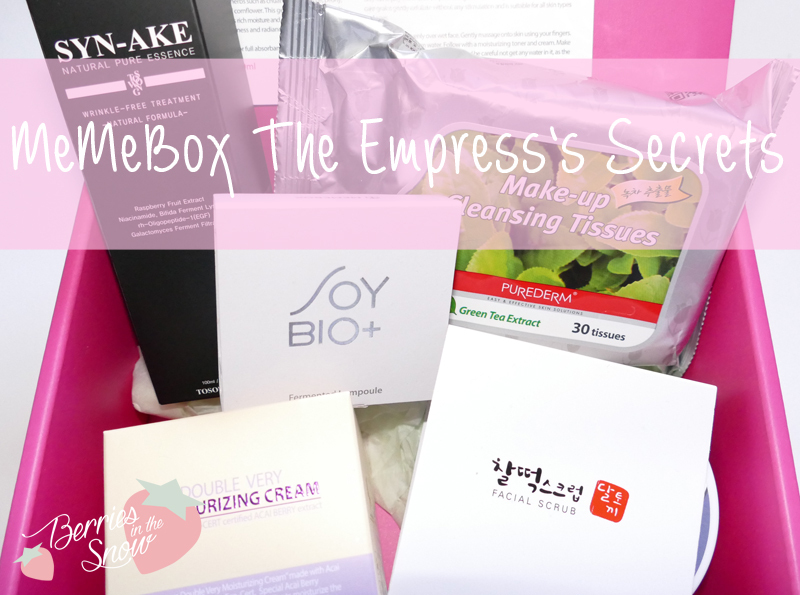 The last MeMeBoxes I ordered in 2014 (apart from the Innisfree Box which was unfortunately cancelled) were the MeMeBox The Empress’s Secrets and Cleopatra. Both boxes arrived before Christmas, but I was busy with a bunch of other reviews and Chrismas holidays that I didn’t have a chance to show you the content of these boxes. So, today I will be showing you what was inside the MeMeBox The Empress’s Secrets. If you like it you should keep an eye on MeMeBox webpage because they will be restocking some of the old boxes during their Big Box Party this week :) You can check out the Cleopatra Box >>here<<. MeMeBox is a box service company, offering a wide amount of different beauty boxes. Unlike most western beauty boxes which have to be subscribed for on a monthly basis, MeMeBoxes can be preordered but that doesn’t force you to buy more than the desired box. They ship to many countries and the products they send in their boxes are mainly Korean. Apart from their monthly Global Boxes, they also have a huge amount of themed boxes, MiniBoxes, Boxes where you know what is inside, so called Superboxes with a higher value and so on (check out the links at the end of the post)…just check out their online store and you’ll find a huge selection of different boxes. Since they have become very popular within the blogger community they sell out pretty fast, but they bring up new beauty boxes so fast, that you cannot keep up with them anyways. That was at least my experience during the last year. At the moment they seem to be focusing on their own brand and some collaborations with well-known blogger in the asian beauty blogger community. At the end of this post I will make a list of all the discounts they offer at the moment, too. Let’s take things way, way back to ancient Korean times. Designed to enhance the skin’s regeneration, revitalization, anti-inflammation, and hydration functions, this royal box will surely leave you with a beautiful and enchanting glow. Unbox The Empress’s Secrets box to reveal the mystical beauty secrets and solutions of the east! This anti-aging essence contains Syn-ake, a synthetic peptide whith a similar structure to snake venom, and other great ingredients, like galactomyces ferment. It is supposed to firm your skin and reduce the appearance of wrinkles. I never tryied any of the syn-ake containing products, but I’ve been always very curious to try, so I was happy about this essence. Cleansing tissues are great for travelling and I like the fact that these contain green tea leaf :) I already used a couple of them and I like to have them. I would also have loved some sheetmasks in this box instead, but this isn’t bad either. This super expensive ampoule with fermented soy bean lump was in a couple of other boxes already. I didn’t have any of the boxes containing it, so I was pretty happy about it, especially since a lot of people seem to like it…but with this price it is not likely that I will or can repurchase this, even if I do like it. Another item I was happy about. I somehow like the packaging design of this product and I like the fact that it contains rice cake as ingredient. I’m really curious about this facial scrub andf I hope it will offer a gentle exfoliating of the skin. 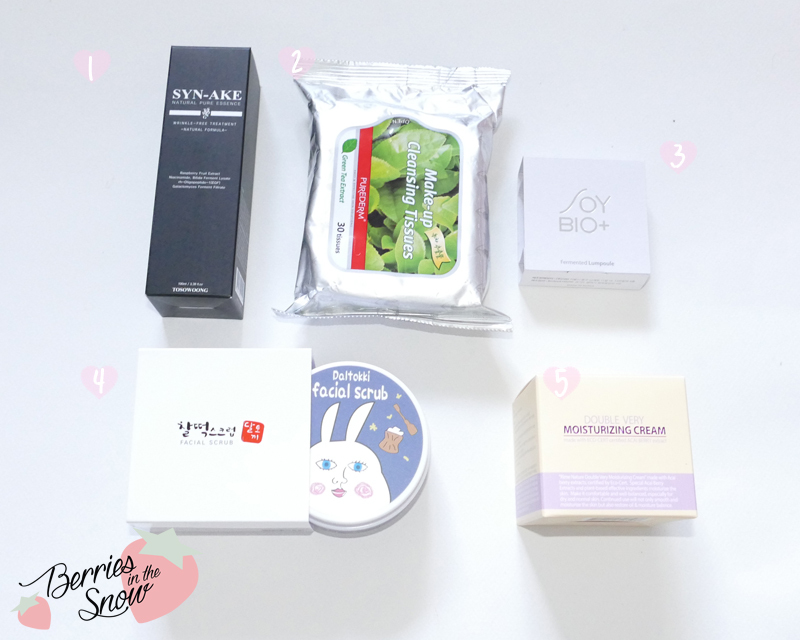 People in need of new skincare items will love this box! It contains cleansing tissues, a moisturizing cream, a facial scrub, an essence and an ampoule and thus contains all the steps you need for a proper skincare routine. I like the products in this box and I will be using all of them in future. I would have wished for more ancient korean themed products or product packaging, like the Daltokki Facial Scrub for example, but the products themselves are great. What do you think of this box? Any product you love? Looks like a really good memebox! The facial scrub packaging looks unique. Thanks for sharing! I think this box contains lot of interesting product, except maybe the tissue ._. Woo I’m glad this one was a winner for you! I’ve tried a Syn-ake product before and it was just ok for me. The soy bean ampoule looks really nourishing and scrubs are always pretty good in my opinion. Even if you don’t like it on your face, you can use it on your body! Hooray for the lumpoule! I love the lumpoule, lol. I’m surprised there aren’t more herbal cosmetics in this box… still a decent one overall though!